Tuna poke flown in fresh from Hawaii. Hand carved prime rib. Chicken with sweet and spicy glaze and cucumber mint relish. Sounds like food you’d find in a gourmet restaurant, right? Would you believe you can also eat all these things at the new T-Mobile Arena in Vegas? Sure, you can still get a hamburger or hot dog during a concert or sporting event if you want, but this is Vegas and we like to do everything just a little bit more over the top than everyone else. So much so that one of the leading mixologists in the world, Tony Abou-Ganim, was called in to create a fresh craft beverage program for the arena and Executive Chef Garry DeLucia from Levy Restaurants was tasked to create an amazing array of fresh food. 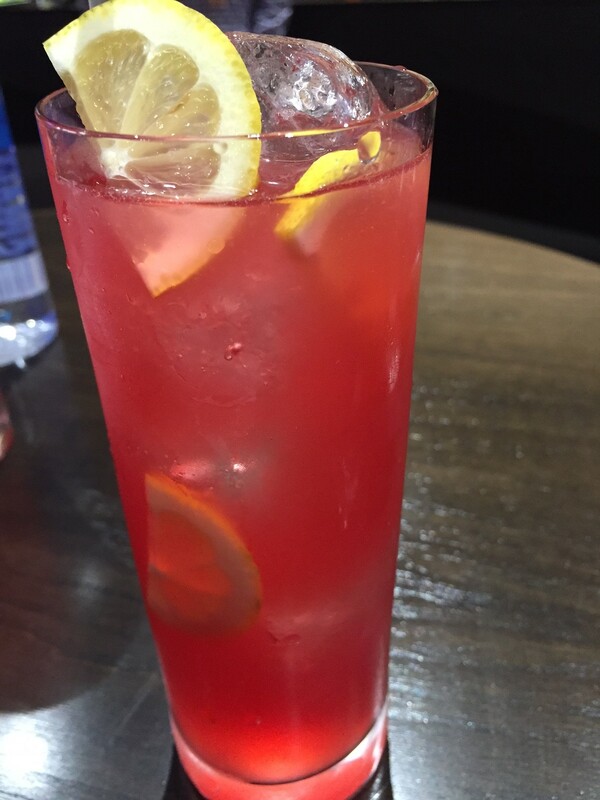 The signature Atomic Fizz cocktail at T-Mobile Arena. Photo by Kristine McKenzie. We bet the arena in your hometown doesn’t have a signature drink, but T-Mobile Arena does. Abou-Ganim create the signature Atomic Fizz (a nod to Vegas’s atomic history), which is available through a special tap system throughout the arena. The drink is made with fresh cactus pear puree, fresh lemon juice, Aperol and agave nectar. You’ll also find fresh from scratch margaritas on tap throughout the venue. 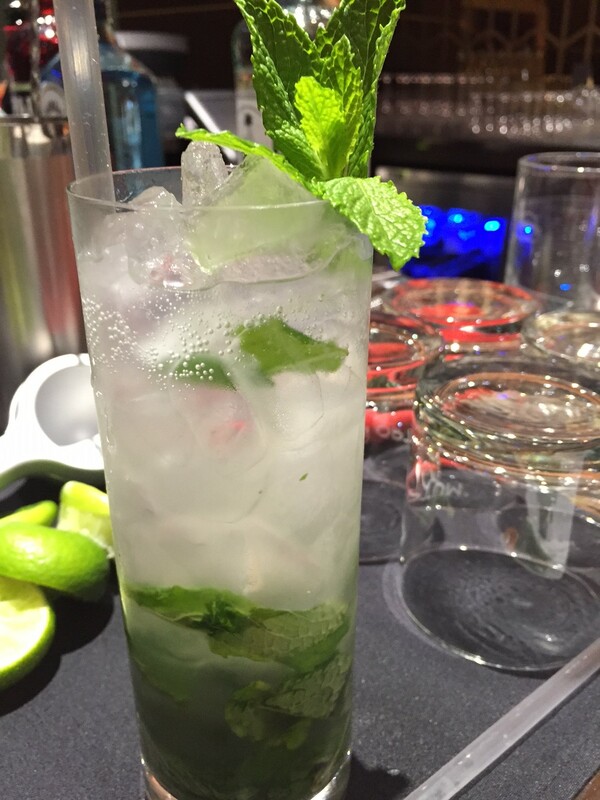 Indulge in a fresh mojito at T-Mobile Arena. Photo by Kristine McKenzie. If you’re lucky enough to be hanging out in a suite at the arena you’ll find cocktail service that’s kicked up a notch. 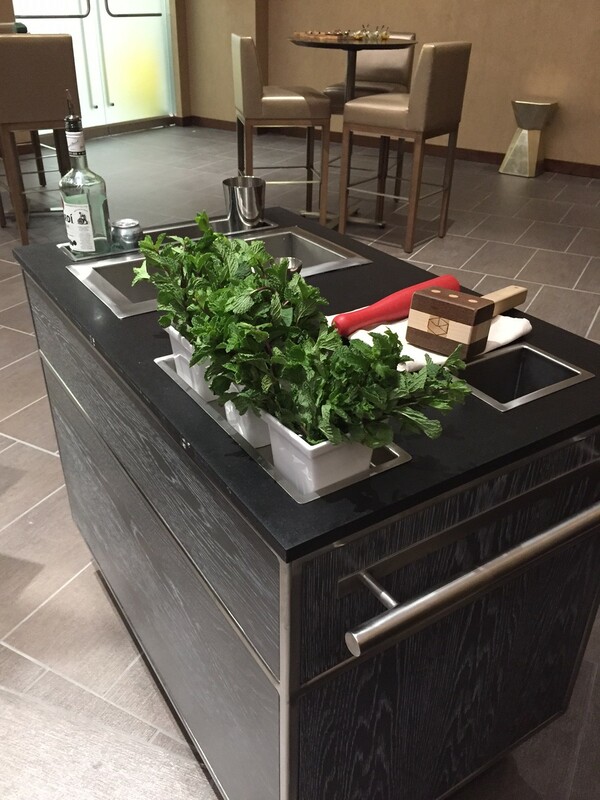 A roving mojito cart comes to your suite and you’ll have fresh mojitos made on the spot for you. There’s also a punch cart and you can either grab a glass of punch or order an entire punch bowl that can serve 30 people. The mojito cart on the suite level of T-Mobile Arena. Photo by Kristine McKenzie. Scratch margaritas can also be delivered to your suite, but there’s a catch — you have to make them yourselves. Don’t worry, you’ll have a video of Abou-Ganim teaching you how to do it. Of course you’ll want food to pair with all of the delicious cocktails at T-Mobile Arena and it’s all made fresh, in-house from a full kitchen on site. The concession stands at the arena aren’t like any you’ve seen before. You’ll find things like quarter pound Angus beef hot dogs. Every 50th hot dog is wrapped in gold foil and given free to the lucky person who orders it. Other concession food includes spicy garlic fries, duck fat frites, pulled pork nachos and Shock Top brats. You might also see a portable cart serving tuna poke or a cart serving dumplings. Order a charcuterie plate or indulge in some hand-carved prime rib. “You’re not going to get this anywhere else,” said DeLucia. 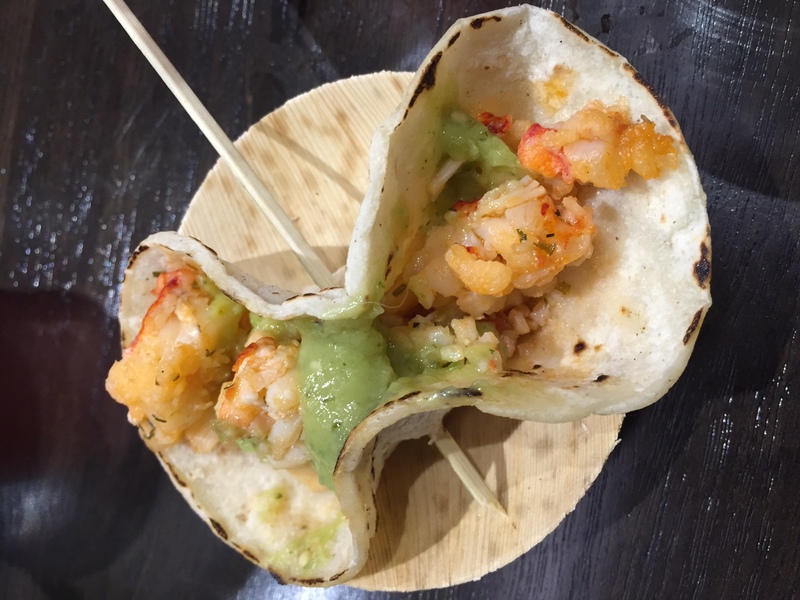 Pair your mojito with a lobster taco at T-Mobile Arena. Photo by Kristine McKenzie. On the suite level of the arena you can indulge in things like a meatball bar with pork verde meatballs, Chinese chicken meatballs and traditional marinara meatballs. Carving carts serve filet mignon, turkey, or beef brisket that comes with a side and starch. And you’ll definitely want to check out the signature dessert cart, which has things like a Fluffernutter pie, warm peanut butter cookies with milk, ice cream with brownies and taffy apples. The arena also has larger party suites that get special menus created specifically for the event that’s going on. For the upcoming George Strait concert there will be barbecue and country-style food and at the Billy Joel concert there will be New York-themed food. Whether you’re sitting in a suite or in a regular seat in the arena, the food and drinks are meant to enhance your experience at a concert or sporting event. We definitely recommend that you indulge. “Come early and have a drink and settle in with some great food and make your experience begin before the show even starts,” said Abou-Ganim.